In the eight decades since its publication, Hemingway's <i>The Sun Also Rises,</i> like a Rorschach blot, has measured not only critics' opinions of Hemingway but also the critical temper of the times. An initial reviewer saw the book as a satire on American expatriates, an unflattering portrait of wastrels and a nymphomaniac wandering Europe. Other critics of the time saw it as a reflection of post-First World War malaise, inscribing for history the Lost Generation - those critics, that is, who took it as a serious literary effort and did not simply dismiss it as pornographic, as Hemingway's own parents did. Since then the novel has been interpreted, variously, as a study of an impotent man's existential dilemma, re-read as a modern-day version of the Fisher King myth, attacked by feminist critics as the macho diatribe of a misogynist, and, most recently, seen as a study of gender roles and the performance of masculinity. 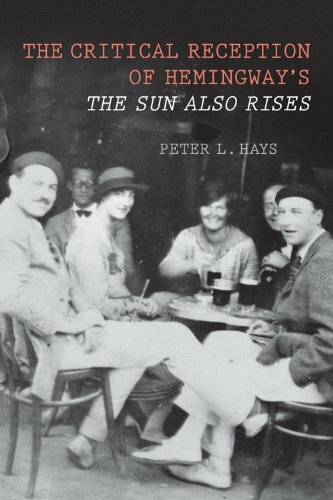 There is no other book that surveys the entire span of <i>The Sun Also Rises</i> criticism, documents the fashionable waves in which criticism has traveled, and points out how each age interprets the novel to suit itself, reflecting the cultural concerns of the moment.<br /><br /> Peter Hays is Emeritus Professor of English at the University of California, Davis.